These are protrusions of disc material into the surface of the vertebral body, which may contact the marrow of the vertebra and lead to inflammation. The protrusions are also associated with necrosis of the vertebral bone and the question of whether these protrusions and inflammation cause the necrosis, or whether the cartilage migrates into areas that have become necrotic due to other conditions, is under investigation. They may or may not be symptomatic, and their link to back pain is controversial. Williams and colleagues note that this relationship may be due to lumbar disc disease, as the two commonly occur simultaneously. Schmorl's nodes are fairly common, especially with minor degeneration of the aging spine, but they are also seen in younger spines. Schmorl's nodes often cause no symptoms, but may simply reflect that "wear and tear" of the spine has occurred over time; they may also reflect that bone strength was at one time somewhat compromised, perhaps due to a vitamin D deficiency although this has yet to be confirmed with studies, or if heavy lifting is done at a young age before the vertebral bodies are completely ossified such as in young farm workers. There is also a strong heritability of Schmorl's Nodes (>70%). While often non-complicating, Schmorl's nodes also tend to occur more often in cases of spinal deformity, specifically Scheuermann's disease. These defects are caused when the vertebra loses its normal function and is not moving/hypomobile/subluxated. During this time the forces normally distributed by the nucleus pulposus (the incompressible gelatinous center of the intervertebral disc) are concentrated in a certain area causing endplates to deform in a concave manner. CT scan in the sagittal plane of two Schmorl's nodes. 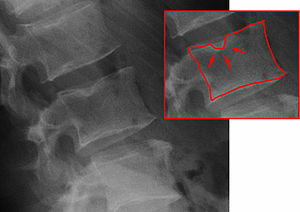 The small Schmorl's node at the inferior endplate of the L3 vertebral body (arrow) has typical features, being broad-based at the endplate, with well-defined contours and thin marginal sclerosis. A large and less typical Schmorl's node (arrowhead) is observed at the superior endplate of L4. Schmorl's nodes can be detected with X-rays, although they can be imaged better by CT or MRI. They are considered to be vertical disc herniations through the cartilaginous vertebral body endplates. Schmorl's nodes can sometimes be seen radiographically, however they are more often seen on MRI, even when not visible on plain X-rays. They may or may not be symptomatic, and their etiological significance for back pain is controversial. In a study in Spine by Hamanishi, et al., Schmorl's nodes were observed on MRI in 19% of 400 patients with back pain, and in only 9% of an asymptomatic control group. The authors concluded that Schmorl's nodes are areas of "vertical disc herniation" through areas of weakness in the endplate. Painful Schmorl's node can be diagnosed by discography, which demonstrates an intravertebral disc herniation with concomitant back pain. Surgical treatment should be considered in a patient with persistent disabling back pain. When surgical treatment is indicated, eradication of the intervertebral disc including Schmorl's node and segmental fusion are preferable. Schmorl's nodes are named after German pathologist Christian Georg Schmorl (1861–1932). ^ synd/2377 at Who Named It? ^ a b Williams, F. M. K.; Manek, N. J.; Sambrook, P. N.; Spector, T. D.; MacGregor, A. J. (2007). "Schmorl's nodes: Common, highly heritable, and related to lumbar disc disease". Arthritis & Rheumatism. 57 (5): 855–860. doi:10.1002/art.22789. ^ Nogueira-Barbosa, Marcello Henrique; Crema, Michel Daoud; Herrero, Carlos Fernando Pereira da Silva; Pasqualini, Wagner; Defino, Helton Luiz Aparecido (2015). "THE SEVERAL FACES OF SCHMORL'S NODE: PICTORIAL ESSAY". Coluna/Columna. 14 (4): 320–323. doi:10.1590/S1808-185120151404151248. ISSN 1808-1851. ^ Hamanishi, Chiaki; Kawabata, Tutomu; Yosii, Takeo; Tanaka, Seisuke (1994). "Schmorlʼs Nodes on Magnetic Resonance Imaging". Spine. 19 (4): 450–3. doi:10.1097/00007632-199402001-00012. PMID 8178234. ^ Hasegawa, K; Ogose, A; Morita, T; Hirata, Y (2004). "Painful Schmorl's node treated by lumbar interbody fusion". Spinal Cord. 42 (2): 124–8. doi:10.1038/sj.sc.3101506. PMID 14765146. Plomp, Kimberly A; Viðarsdóttir, Una Strand; Weston, Darlene A; Dobney, Keith; Collard, Mark (2015). "The ancestral shape hypothesis: An evolutionary explanation for the occurrence of intervertebral disc herniation in humans". BMC Evolutionary Biology. 15: 68. doi:10.1186/s12862-015-0336-y. PMC 4410577. PMID 25927934. Lay summary – BBC News (27 April 2015). McFadden, K D; Taylor, J R (1989). "End-Plate Lesions of the Lumbar Spine". Spine. 14 (8): 867–9. doi:10.1097/00007632-198908000-00017. PMID 2781398. Peng, B; Wu, W; Hou, S; Shang, W; Wang, X; Yang, Y (2003). "The pathogenesis of Schmorl's nodes". The Journal of Bone and Joint Surgery. British Volume. 85 (6): 879–82. doi:10.1302/0301-620X.85B6.13555. PMID 12931811. Takahashi, K.; Miyazaki, T.; Ohnari, H.; Takino, T.; Tomita, K. (1995). "Schmorl's nodes and low-back pain". European Spine Journal. 4 (1): 56–9. doi:10.1007/bf00298420. PMID 7749909. Wikimedia Commons has media related to Schmorl's nodes. This page was last edited on 14 December 2018, at 18:59 (UTC).